The experienced team at Zeng has developed superior skill in creating water features. 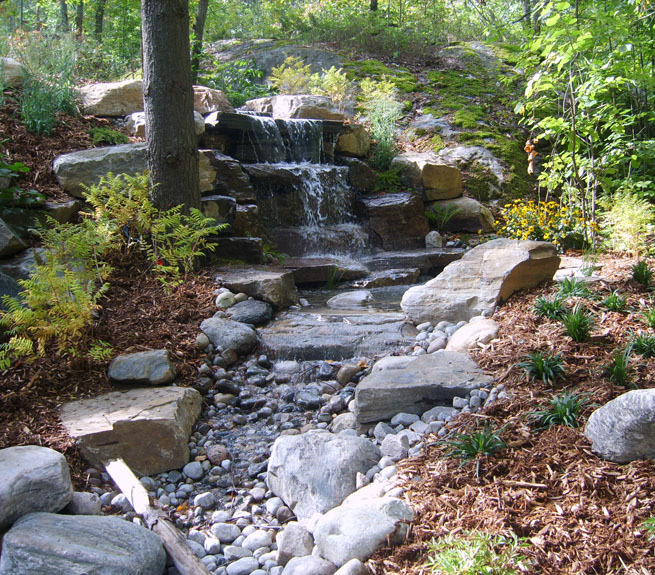 Whether it’s something as simple as a weeping rock or a waterfall and/or stream system, our water features add a pleasing kinetic dimension to any landscape design. Zeng has many years’ hands-on knowledge of how adding water creates a living landscape. Even in a small area, water features bring sounds and movement into your living environment. Our vision is to integrate water features with pools and hot tubs. Zeng ensures that site layout, elevation and accessibility are optimal for maximum enjoyment. Zeng Landscaping has a strong network of pool, spa and irrigation specialists who provide dramatic results, as well as ongoing service and maintenance.